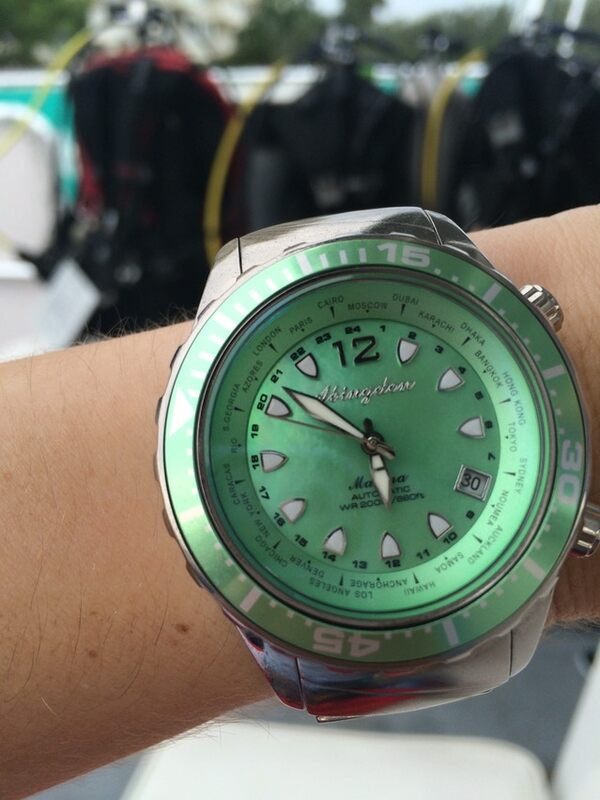 In 2014 professional pilot Abingdon Welch launched a US$66,000 Kickstarter campaign to fund a female dive watch. She successfully achieved her target after 258 backers believed in her, and the result was unveiled at the 2018 DEMA Show in Las Vegas. The Marina dive watch took three years of research and development, with input from a team of seven female Dive Pros. The brief was to design a luxury looking watch that women would want to dive, that wasn't "pinked or shrinked". The Marina has an automatic, self-wind movement with a 40 hour power reserve, hence there is no need to open the Titanium casing to replace a battery. The 20 mm / 0.7 inch wide band is also made from Titanium (to keep the weight down) and it comes with a fold-over clasp and band expander, so that the watch can be worn over a wetsuit. The 200 mt / 656 ft water resistant watch has a luminous dial and markings, and there is a choice of seven different colours for the face. This watch has a unique inner bi-directional Bezel that displays all 24 international time zones.